Welding has never been so easy. Nor so powerful either. Never as quick at any rate. With a piggyWelder®, it was always easy to weld simply and quickly. The brand new piggyWelder® 3 Power+ gets the job done even faster and easier. More powerfully than ever before. The amperage (TIG) has been increased by 15% to 720 A. It means you can weld wires of up to Ø 1 mm perfectly. To ensure that the device always stays nicely cool, we have incorporated an active cooling system, that only activates when required. The ingenious handpiece has been improved even further. Avoidance of welding errors due to interruption of the welding process in case of excessive pressure on the electrode. Increased service life of the electrode tip. Avoidance of tungsten inclusions on surfaces or on workpieces and materials that still need further processing. Improvement in overall welding quality through more even work. 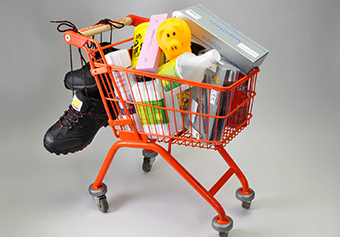 Avoidance of errors during handling: Enhanced process reliability and more consistent quality. You touch the exact spot you would like to weld with the electrode tip. (Very accurate). If no, a beep sounds. If yes, the welding process starts. The electrode is retracted into the handpiece by an electromagnet. The microscope is closed for a few milliseconds. The rod is secured using the green fixing handpiece. Fix it in a number of places and weld an extremely precise seam. Or attach the rod as protection for sensitive surfaces, e.g. graining that you do not want to damage. Or attach a non-detachable compensating film. Makes your life much easier during assembly and of course during disassembly. 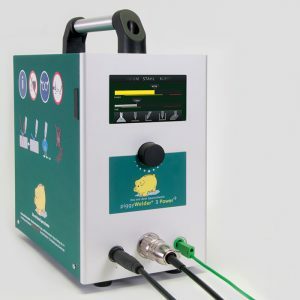 The new piggyWelder® 3 Power+ has a higher output and a higher pulse frequency for the fixing function. The microscope is controlled by the control unit. This provides reliable eye protection. 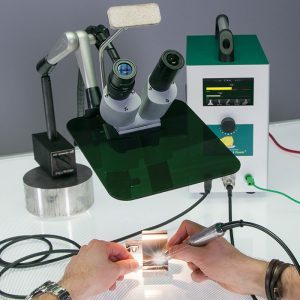 With an open microscope, you can see the area in which you want to weld clearly and brightly illuminated. The built-in LED light illuminates the entire area evenly. You can select luminosity from the menu: 50%, 75% and 100%. 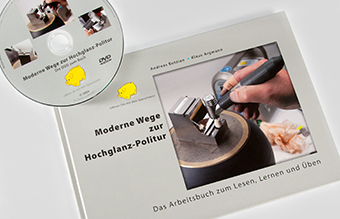 This avoids glare when welding on highly polished surfaces. Once the welding process is started, the LCD view guard filter closes the path of rays for the duration of the welding time and your eyes are reliably protected. This all happens in milliseconds. The microscope head can be positioned quickly and easily using the hydraulic swivel arm. The switching magnet is particularly helpful. Owning a piggyWelder® gives you an additional benefit. 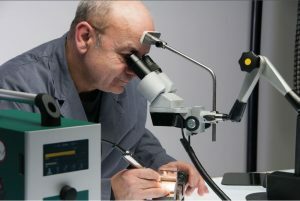 The microscope can also be used for quality control or for very precise polishing in tiny places. LEARN THE BASES OF PRECISION WELDING IN 30 MINUTES WITH THE PIGGY®TEACHER. The more you know about the piggyWelder® 3 Power+ and precision welding, the better results you will achieve. 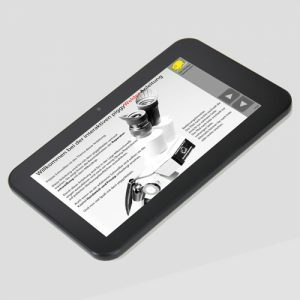 We therefore developed a teaching program for you that runs on an Android tablet. 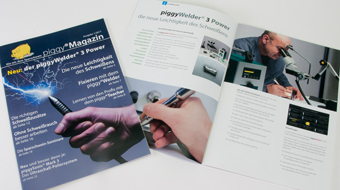 You will learn how to use the piggyWelder® 3 Power+ successfully based on short texts, videos, diagrams and animations. The program is full of useful information all about welding. You will receive an Android tablet, on which the piggy®Teacher is installed read to use with each piggyWelder® 3 Power+ You should study with the piggy®Teacher before starting to weld. This takes only about 30 minutes and I can promise you, you will benefit from it. If you keep the piggyWelder® 3 Power+, you can of course keep the tablet too. If not, you will have to return it all with a heavy heart. (It is highly likely though that this will not occur, as almost all users have been delighted up to now). Preferably see for yourself by conducting you own trial. 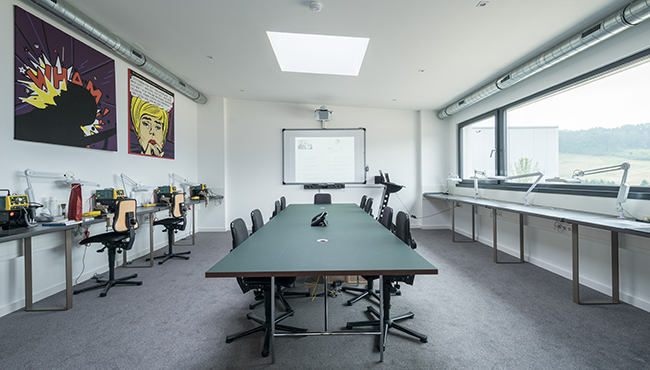 We will be pleased to send you a complete system including wires according to your specifi cations for an 8-day test. Free of charge and without any commitment. Including the piggy®Teacher. Flowmeter, Brass brush, 10 each special electrodes Ø 0.6x 50 mm, Ø 0.8 x 50 mm and Ø 1.0 x 200 mm (without tips) with 1 diamond grinding disk each. 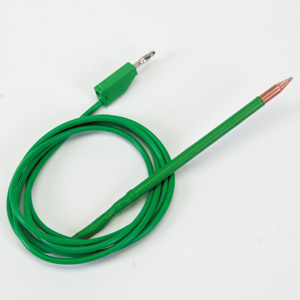 Foot switch 5 m gas hose, Green transparent protection shield.